Crossed a massive river as we neared DC. I checked the GPS for the name, and what a fascinating Indian word it is, "Susquehanna", meaning "Oyster River". We'd come a long way from NY, five hours flat to DC on a half tank of gas. This was the first time I've opted to drive rather than taking mass transit. Figured I'd have more freedom if not bound by the bus schedule. Up early in the darkness at 5am, gulped some bad hotel coffee, hailed a cab, and made my way to the Tidal Basin. It may not be peak season, but there sure are Cherry Blossoms! 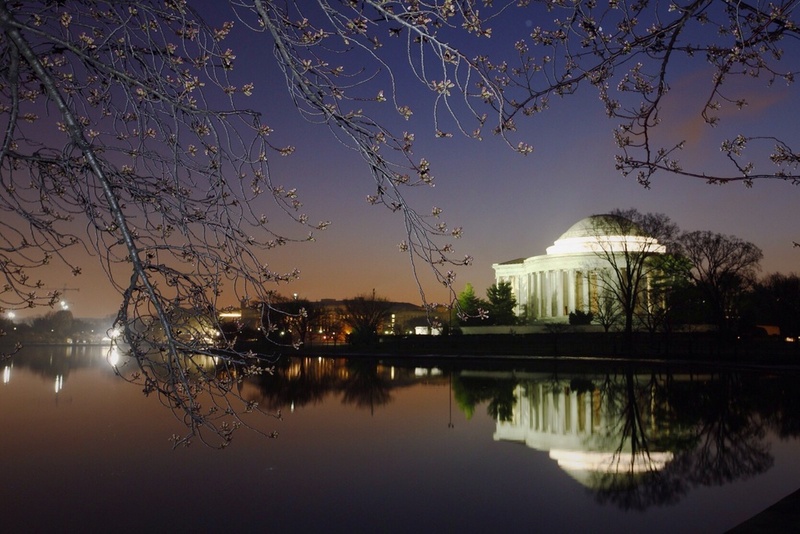 I used the flowers to frame the Jefferson Memorial at dawn.